Larian Studios latest Limited Edition will include two full games and lots of plastic pieces. If you're a gamer who likes swag, unpacking up a limited edition of a game feels like Christmas came early. Developers and publishers alike will release collector's sets of their biggest titles packed to the gills with physical and digital bonuses, sometimes to the point that it might weigh you down carrying it out of the store. Larian Studios has its own twist planned for the upcoming RTS Divinity: Dragon Commander; the developer intends to include a complete board game version when its limited edition releases next year. 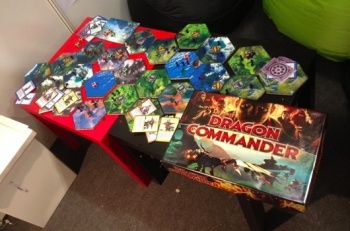 Larian Studios originally designed the board game as a way to test Dragon Commander's strategy mechanics before implementing them in a digital format, and found it enjoyed the physical version so much that the decision was made develop it into a full release. The developer had a prototype available at its Gamescon booth this week, and based on the attached will feature a large, randomly-generated board reminiscent of Settlers of Catan, but with a focus on RISK-themed strategy and combat over resource gathering. Dragon Commander itself is (or rather, was) a PC-exclusive RTS set in the Divinity universe that features large-scale battles between steampunk-fantasy armies, including elves, dwarves, undead, and I kid you not, fire-breathing dragons equipped with jetpacks. I repeat, Dragon Commander is a fantasy game in which dragons wear jet packs. Because if you're going to be excessive, you might as well be fantastically excessive. Larian Studios is currently in the process of finding a manufacturer to construct the release edition of the board game. Divinity: Dragon Commander's regular and limited editions are set to launch in March of 2013.